Nostalgia often plasters over some of the glaring errors in “classic” movies, especially animated ones. That is definitely the case for The Last Unicorn. Ask many people who watched the film as a child and they will recount a magical tale which bewitched them when they were young, watching in awe. Try to watch this movie for the first time as an adult and it is difficult to see what the fuss is about. For starters, the tone seems all over the place. This is a movie which follows a magical unicorn as she tries to finds the rest of her kind. The movie starts quite light, with a bizarre scene involving a random butterfly who talks in riddles, but as the movie progresses, it seems to get strangely darker and creepier. In some cases this darkness can spark imagination and creativity. A passing carnival captures the titular unicorn and enslaves her. It is here that we get to see some of the magic and creativity of the film; an encounter with a creepy Harpy being one of the highlights. Unfortunately, moments like this are over before they truly begin and what we are left with is a strange, confused movie with a bizarre plot. The whole point of the film is to get to a castle where the unicorns were seen last. It is here that we meet the principle villain, some strange supporting characters and the movie takes a bizarre turn by changing the unicorn into a human! All of this makes little sense and doesn’t really go in any clear direction. Add to this a strange love story with no development and riddle about a talking skull which makes no sense but takes up about twenty minutes of the film. Even the villain of the story, usually an easy character to get your head around, doesn’t really seem to know what they are doing either. It isn’t clear why he wants the world’s unicorns or why he is a villain at all. For most of the film he just seems to skulk and sulk around. What is bizarre, considering how badly the movie is written and plotted, is the excellent voice cast it attracted. Jeff Bridges plays the last minute hero, Alan Arkin an annoying magician/wizard, Christopher Lee brings heavyweight to the awful villain while Mia Farrow plays the unicorn/human. It seems these actors were looking for an easy paycheck because none of them could have understood the script or what was really going on! As weird and inconsistent as the story is, the animation seems to go the same way. Some design is impressive, the aforementioned Harpy and the first villain of the movie, the Red Bull, are inspired and very scary designs, enough to terrify young children. In other cases, namely the unicorns, they have a strange look about them, as if their legs and body are out of proportion. I know this was the 1980s but animation had reached better quality than what this delivers. 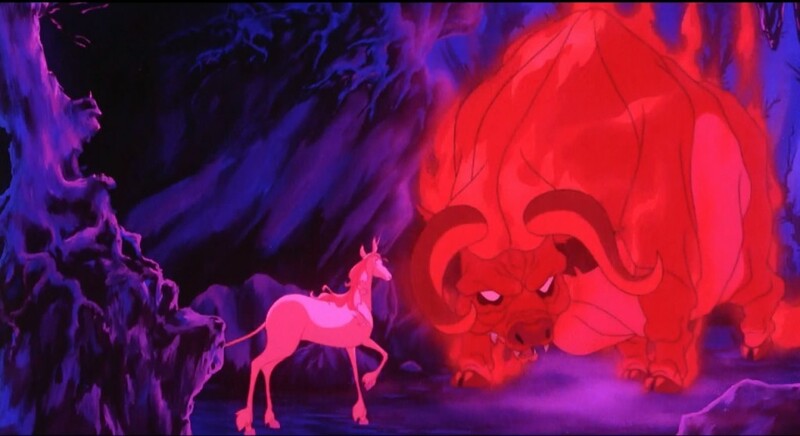 Overall, many people count The Last Unicorn as a childhood favourite and it may well bring a nice ting of nostalgia to them but for an adult watching for the first time, this movie struggles with so much. The tone is out of place, the story makes little sense and the writing is awful. Only a great cast and some inspired character design manage to make this movie slightly interesting. One of my earliest moviegasms, i left the theater in complete awe. BUT recently i searched for it on youtube and i was in for a shock. Then i kept distance from it. Not every kids movie ages well like “Labyrinth” or “Neverending Story”. THIS and the “Lord of the Rings” animated movie, are things better left in the past. I’m glad you agree. My wife who subjected me to this is still of the opinion that it is a decent movie.